Sometimes I have PCBs for sale or complete panels full of analogue joy. Equinox OZ - synth module supplier in Australia!!! and VIDEO SYNTHS: LZX VISIONARY MODULAR VIDEO SYNTHESIZER . After years of solid DIY I have ordered the two core video synth modules from LZX. They can be used as the foundation of a large modular video synthesizer. The guys at LZX know their stuff and have come up with a great and growing range of video synthesis modules. By no means an exhaustive list, plenty more module manufacturers out there. PCBs: If you haven't figured it out yet I like CGS designs. - Ian Fritz - - Maybe the 1st person to design chaos circuits specifically for synths. 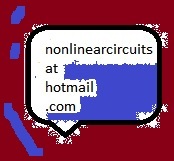 - A Yahoo group for sharing, developing and discussing chaotic circuits to be used in synthesizers.